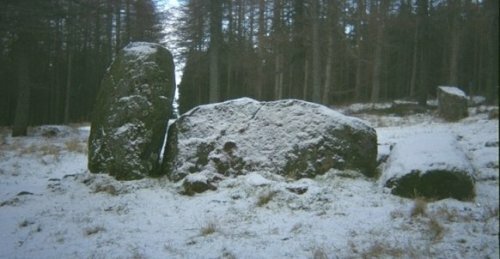 The stone circle variously named as Garrol Wood/Ninestanes Mulloch Wood is prettily situated among Forestry larches, carpeted in heather and blueberries. The surrounding trees unfortunately obscure the sunlight at most times other than high noon in summer. Take the A957 Slug road south from Crathes and in three miles fork right just before the bridge over the Burn of Skeloch, at Blairydryne. Follow the road for two more miles up around the wooded Mulloch hill. There is parking space at the forest track on the right. The nearest buses are to Banchory, plenty of them, but it's a long walk. The circle is 100 m up the track, on the right. Nine stones plus the mossy recumbent stone still stand in an ovoid circle, the stones linked by a low bank. In the moss-covered ringcairn a stone lined pit was excavated at the centre containing burnt bones and charcoal. Also found were urn sherds and several human cremations in hollows around the cairn.